Welcome to the first edition of Great Motorcycle Rides. I’ll be writing about amazing routes and trails from all over the world that you can take on your motorcycle. Some will contain information from personal experience while others will be compiled from what other riders have done. In this first edition: a ride that is worth the long journey to Bolivia. The Death Road. Northeast of La Paz, Bolivia there is a small but very beautiful town called Coroico. It’s nestled at the top of a mountain in the Bolivian jungle and boasts some of the most spectacular views anywhere in the world. The fact that it’s not more well-known makes it a perfect little sanctuary to relax. Where else can you sunbathe next to a pool surrounded by lush vegetation while admiring snow-capped peaks in the distance. It’s quite surreal. The thing about Coroico is that you have to earn your way there and the challenge is the ultimate rush for any true adventurer: the world-famous Death Road. This is a 40-mile (65 kilometers) road that is essentially carved into the side of the mountain. It’s a 10-foot wide dirt road that has no guard rails, blind corners, and vertical drops of up to 2,000 feet (600 m). It gets very muddy during the rainy season (November – March) and has had the distinction of being named the world’s most dangerous road with up to 300 deaths a year until 2006. Unlike the rest of Bolivia, drivers are required to drive on the left side of the road and give way to traffic going up the mountain. On your way down this will put you at the edge of the cliff, and while scary at times, you need to trust the rules and trust me. Riding on the left ensures a safe passage for everyone. It’s not like you’re going to be dodging trucks and buses anyway. 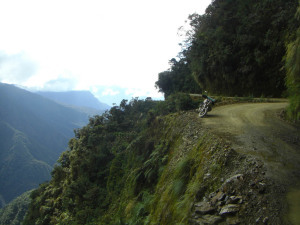 Since the construction of an alternate multi-lane asphalt road in 2006, the old Death Road is largely transited by mountain bikers on a short adventure tour from La Paz. Though they are accompanied by a van, it’s the bikers you’ll want to keep your eyes on. Some of cyclists are so terrified of the cliff but want to complete the ride that they’ll stick to the wall on the right (essentially riding on the wrong lane). You’ll have no trouble spotting them, though. They’re the ones with fear pouring out of their eyes. You take off from La Paz where you’ll first climb to 15,200 feet (4,650 m) before starting your descent. The climate and terrain change you’ll experience is dramatic. In the rocky highlands you’ll experience cold and shortness of breath and as you work your way down, the mountains will turn from yellow grass and shrubs to thick, green vegetation. 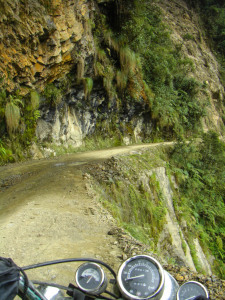 There is a marked detour on the way down indicating the old North Yungas Road. This is where the asphalt turns to dirt and you’ll want to shed some of those layers here as the jungle tends to get very hot. A short ride along the dirt path will reveal your first glimpse of the Death Road in all its dangerous glory. See that little strip cutting across the mountain? That’s the road. Once you start making your way down you might overtake some of the bicycle tour groups that are common on the road. Just follow the road rules and nobody should have any trouble. In the spirit of decency, don’t overtake them very fast for your safety and theirs. A few of them might be so tense that they won’t hear you coming. It’s also not cool to leave a cloud of dust in the air as you go by. If you feel uneasy about overtaking the cyclists, just ride at their pace for a while and they’ll eventually stop for a break. Their tour guides will have them stop at several places to drink water, gather the whole group, and take some pictures. This is also a good chance for you to get a few pictures yourself and their tour guides will be happy to photograph you. Despite its fame for being such a dangerous road, it is very beautiful. You’ll see views like no other and it’ll be worth your while to pace yourself and take in the scenery. This area is also home to the Andean Condor so you might be lucky enough to see some flying by. They like to fly close to the road but despite their massive size it’s not like they’ll be able to pick you off your motorcycle (or will they?). 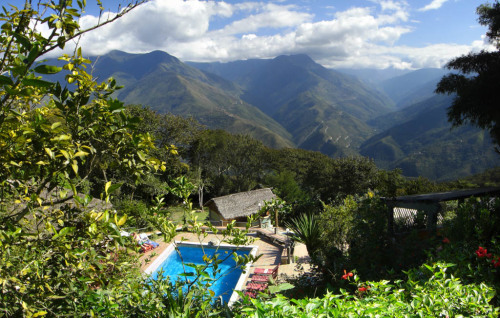 Once you reach Coroico, you can stay there for a few days and just relax. Accommodation is cheap and there are a few natural attractions in the vicinity like waterfalls and hiking trails. At 3,900 feet (1,200 m) the altitude here isn’t as taxing as La Paz. Once you’ve relaxed enough at Coroico, you can return to La Paz and either head towards Lake Titicaca or go south along the highlands towards Uyuni, home of the world’s largest salt flat (Bolivia is a motorcycle adventurer’s dream). If you feel like the Death Road was not as thrilling as you had expected (some people are like that), you can follow the road deeper into the jungle and it’ll eventually spit you out into the lowlands. 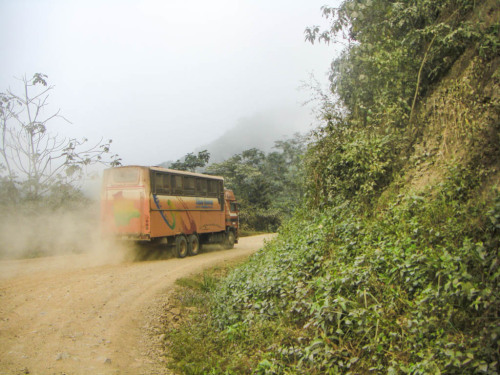 Before you hit the long stretches of road in the lowlands you’ll first have to go through another 137 miles (220 km) of more Death Road where you will be sharing the narrow road with trucks, buses, and some sort of truck-bus mashup that locals use as public transportation. This is the road for the true thrill-seekers and I can personally tell you that it’s crazy exciting. Have you ever seen a Frankenbus like this before?! If you have any questions about the famous Death Road, Coroico, or what lies beyond just leave a comment below and I’ll happily get back to you. If you’ve already done the Death Road, I’d love to know about your experience and thoughts on it. Amazingly written and presented! Awesome stuff!